We dont use any tamarind for this kuzhambu and I have heard people saying it as "Puli illa kuzhambu". 1.Add turmeric powder to moong dhal and cook well with enough water in a pressure coker.Keep aside. 2.In a pan,add oil and then fry seasoning vadam/vengaya vadagam.This is very important for this kuzhambhu.This only adds flavour to poricha kuzhambhu.Keep the fried vadam in a vessel. 3.Now,in the same pan add water,sambar powder,salt and cut beans. 4.Cover the pan with a lid and allow the contents to boil well. 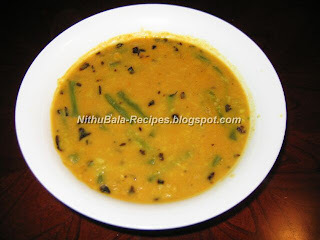 5.Once the beans are cooked and the raw smell of the sambar powder is gone,add the well cooked moong dhal. 6.Mix the contents well and close the pan with the lid.Keep it for another 5 minutes in medium flame. 7.Just add the fried vengaya vadagam and mix well. Note:Vegetables like drumstick, carrot, brinjal, snow peas and snake gourd can also be used.